After choosing “Choose a Stations” of the Settings menu you will find the list of predefined stations, the possibility to edit the stations and to create new ones. To choose a predefined station, simply click on its name. In this figure you see the default ‘local’ phonebook and the checked station is ‘Echo server’. The Echo server is a free service and is meant for test purpose only. You can always use this to test your internet connection, the stream you send will be sent back, so you will be able to hear yourself back with a short delay. The server is located in a datacenter in Amsterdam, The Netherlands. 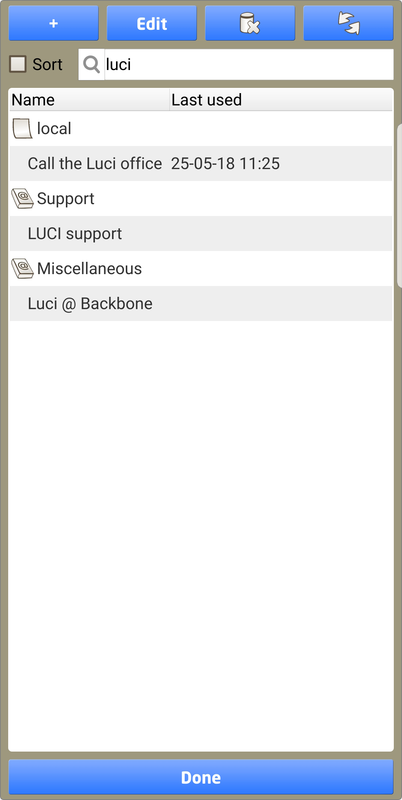 If you would choose ‘Call the Luci office’ you will establish a direct connection between you and the Luci office. You will be talking to one of our support engineers, this will help us in supporting you. We can then do measurements of your stream for example, or to simply help you in determining issues with your audio card. NOTE: The connection with the Luci office is normally not active, please schedule an appointment at https://support.technicadelarte.com if you want to connect to us. Sort the list by station name. Edit the station parameters (protocol; codec; bitrate; jitter buffer; destination; channels; bit depth; auto record; sample rate). Delete a station from the list. Reload the phonebook ( if loaded from internet ). Go back to the main screen with the selected station. The search bar. Click in the bar for text input. At every input you will only see the items that include the text.